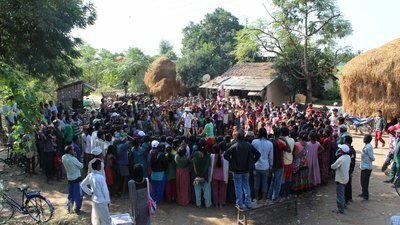 Voter education campaigns and mock polling sessions in Nepal help to prepare voters for upcoming elections. 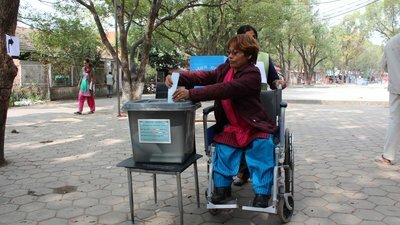 A woman with a disability participates in a mock polling session held in Nepal in 2013. 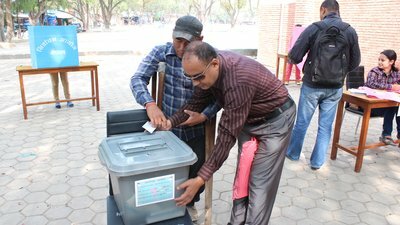 In a 2013 mock polling session in Nepal, a man who is blind examines the ballot box before casting his vote. 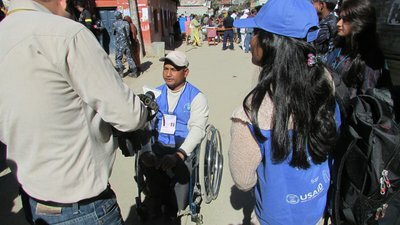 Krishna Chaudhari, an election observer, is interviewed by local media in Nepal in 2013. A voter peruses voter education materials available in Braille. A community facilitator provides voter education for Nepali citizens with disabilities. A large crowd watches as performers (some with a disability) act out a skit about voting in Nepal. A street performer shares information about voting and elections before election day in Nepal. Dipawali Sharma, an election observer who is hard-of-hearing, watches as people cast their votes on election day in Nepal.